Have you been following what our Cheesehead neighbors to the north have been up to lately? All photos by Chicagoan shaggyisaac. It's pretty bananas. Mother Jones has some excellent background and explanation of what's going on. The bare facts are that Governor Scott Walker has proposed what unions describe as a "draconian" anti-union bill that would end collective bargaining in Wisconsin for public employees. Unions, students, and progressives have freaked out, occupying the capitol and holding continuous protests for over a weak. Everybody agrees--it's a really big deal. So big, in fact, that many Chicagoans felt the need to put aside their still-aching wounds from the NFC championship game last month and make the trek up north to support the protesting unionists. 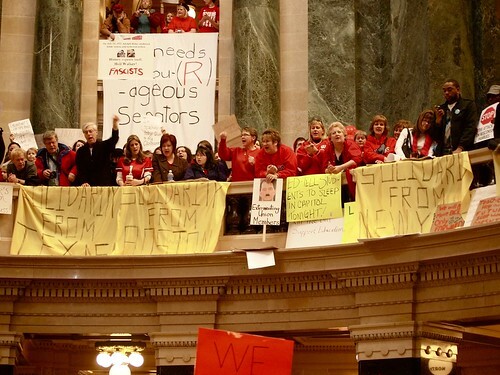 Wisconsin is known for being a very pro-labor state, having introduced many crucial labor reforms American workers now taken for granted--including, ironically, the right for public employees to bargain collectively. But Chicago is known as being the American labor city--our city has been the home to scores of epic labor battles, from the Haymarket Massacre in 1886 to the longest strike in the country today at the Congress Hotel. Wisconsin and Chicago both have unionism running in their blood. It makes sense, then, that someone like Mark Paye, a teacher at Roberto Clemente Community Academy in Humboldt Park and a member of the Caucus of Rank and File Educators (CORE), felt it his duty to make the drive up to Madison on Saturday to join the Wisconsin protesters. He marched with 60,000 others around the state capitol, holding a Chicago Teachers Union sign, and said he could imagine a similar bill affecting him and his fellow public employees. "What's happening here could happen in Illinois very easily," he states. 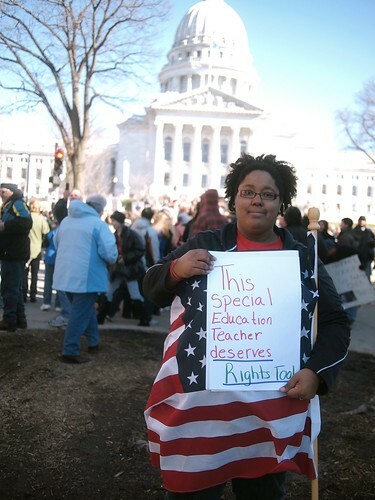 Paye, like many other Madison protesters, sees Walker's proposed bill as an attack on collective bargaining rather than an attempt to balance the budget. "We're willing to negotiate our salaries and health care and be reasonable," he says. "But this bill doesn't have anything to do with economics--it's a clear attack on unions. Taking away collective bargaining has nothing to do with balancing the budget." 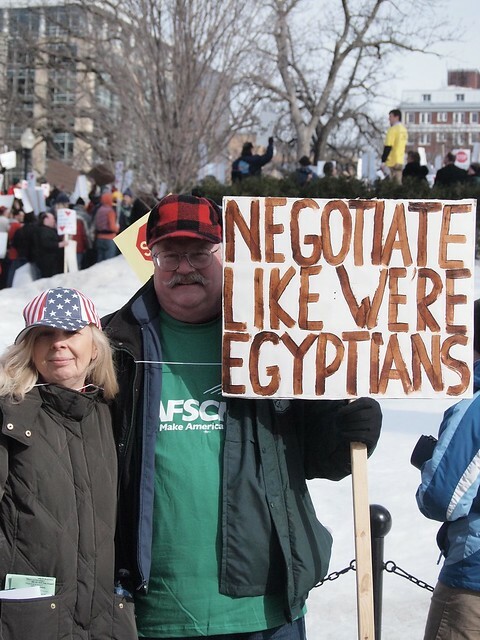 It was a sentiment heard throughout the day in the streets and inside the capitol, where Caitlin Rogers held a sign reading "SEIU Local 73 Supports Wisconsin Workers." 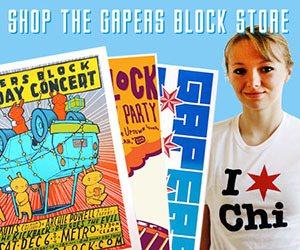 Rogers is an organizer with the Service Employees International Union in Chicago. She leaned on the marble railing of the capitol's rotunda, doing her best to make her voice heard over the booming chanting and drumming behind her. "It's important to stand up for working people everywhere--an attack on families here could just as easily lead to families across the United States," she said. She saw the bill as symptomatic of a larger attack on public unions and employees in Wisconsin, Chicago, and beyond. "A lot of the focus is being put on hard-working public servants rather than the people who were really responsible for this crisis. Public servants across the country right now are being unfairly targeted." 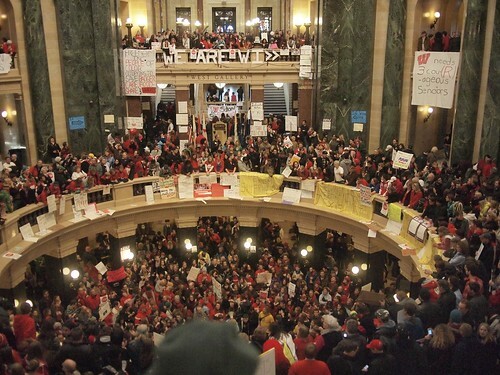 Trade union members are not the only ones in the streets in Madison--graduate students have played a huge role in maintaining the fight in the capitol. Graduate students from Chicago came up to lend their support, as well. Andrew Yale, a grad student in English at the University of Chicago and a member of Graduate Students United, was in Madison Saturday. Standing outside the war room of the Madison graduate students' union the Teachers Assistants Association, a commandeered conference room on the third floor of the capitol packed with slightly smelly grad students hunched over laptops, occasionally shouting news to one another, he explained his presence in Madison by referencing the oft-repeated union phrase, "an injury to one is an injury to all." And Yale feels UChicago students have some injuries. 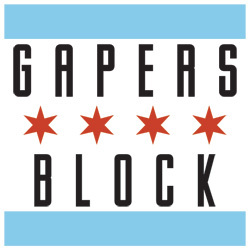 "In Chicago, we currently have no legal bargaining rights. Student employees have never had a say in the terms of their employment," he explained. 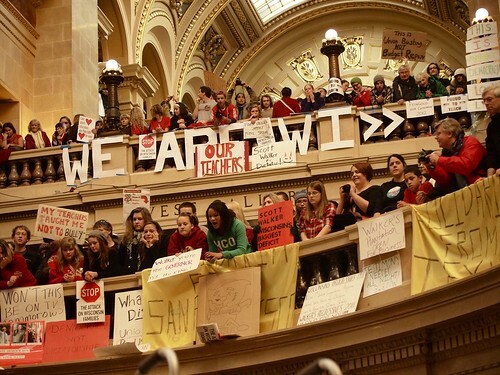 "Grad students in Wisconsin face being stripped of their rights. We see our campaigns as closely aligned." Unionists frequently throw around the word "solidarity," echoing Yale's claim that all workers' fights are closely aligned. Whether that Windy City solidarity will have any impact in thawing Gov. 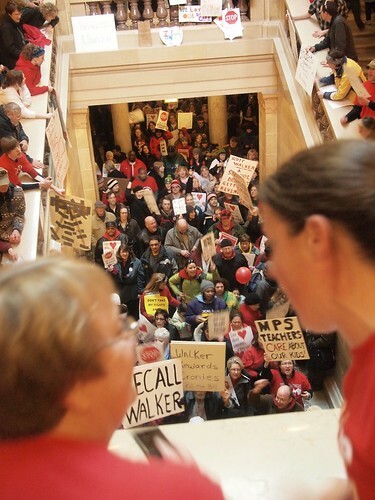 Walker's icy anti-union heart will be decided in the coming days. 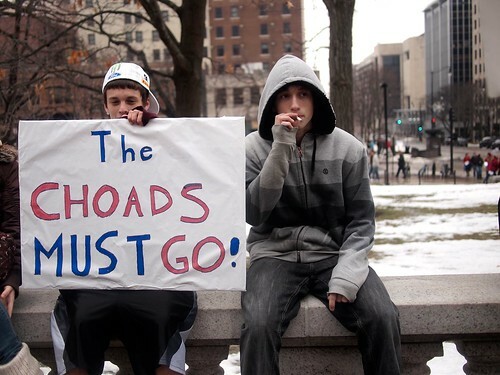 There was even a contingent of high school protesters who were too cool for the protests. 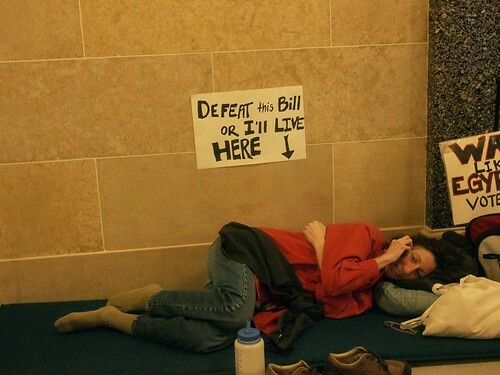 Protesters sleeping at the capitol. Thank you for this coverage! As a doctoral student in English at UW-Milwaukee and a member of the Milwaukee Graduate Assistant Association (MGAA), I would like to add that the "war room" on the third floor of the capitol is also staffed by MGAA. TAA has done a huge amount of work and deserves recognition for it, but I also want my colleagues, who have given their days and nights to working in the capitol building, to also be recognized. Micah - you do understand that by setting the "bare facts" in alignment and based on the viewpoint of one of the involved parties, you undermine your credibility, right? That aside, the irony is so compelling. Multiple organizations which are not subject to, nor under the jurisdiction of Wisconsin labor policy, choose to travel from outside of Wisconsin in order to excercise free speech in support of policy where they have an ideological interest but not a material interest. The irony is that this is the situation that these organizations describe as unacceptable in light of the US Supreme Court's Citizen's United decision - corporations, (which are merely a collection of freely associated indivudals) donating their resources (time, money, etc.) to support causes that they have an ideological interest but not a material interest. SEIU's Anna Burger: "With today's Citizens United decision, the Court has given corporate managers the greenlight to bypass the checks and balances, use unlimited amounts from the general treasury--funds that should be used to increase the value of the business or pay dividends to shareholders--to instead pay for public communications expressly advocating the election or defeat of the candidates of their choice"
Interesting that she does describes the practice of using general revenues and PAC establishments in order to fund campaigns, because that is precisley what public employee unions do with the money that they collect from members and the revenue that they make from benefit negotiation practices. So it is really an issue where there is "free speech for me, but not for thee"
And my favorite entrant into the conversation has to be President Obama, who alleges that a requirement that union members contribute to their healthcare costs is an "assault on the unions", but when asked about an individual's contribution to their health care costs it is an "individual responsibility", under mandatory compliance and threat of financial penalty. WTF, indeed. These are some oddly conflicting positions to be in, except that they aren't conflicting when you understand that without the public union campaign contributions, the unions would lose political influence and the democratic party would lose one of its largest, if not the largest, source of campaign funding. Yep, there is no pattern there. As someone who has been on the ground in Madison for several days, I can confirm that more than a few unionists referred to the bill as "draconian;" many others used much stronger words. 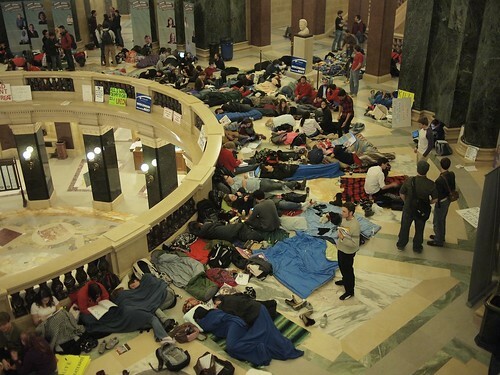 Students and progressives and union members, have, indeed, occupied the capitol for over a week--there is no question that that has taken and is taking place. And the link that I provide is merely a piece of analysis by the foremost labor journalist in the country; there are quite a few other journalists and analysts who I could link to who also think this is, in my words, "a really big deal." So I'm not sure where my credibility should be undermined here. WAJ, I'm getting tired of telling you to stop coming into these comments sections and accusing people of not having integrity. Stop immediately. Troll elsewhere. I'm not accusing Micah of not having integrity, I'm saying his credibility is undermined by his editiorial choices. You are an editor, you should know there is a difference. I'm not attacking his character, so quit the ad hominem. Its boring. Your story is, in as much as you link for background, a derivative of the Andy Kroll piece. If Andy Kroll is the foremost labor journalist you say (is there a scale for foremostness? foremostcosity? ), his expertise is in labor journalism. How does expertise in labor journalism translate into expertise in state budget analysis? Does his labor journalism experience render him experienced in risk managment? if I recall correctly, journalism degrees are earned with some of the lightest math requirements, so its fair to say that his analysis is not a mathematical analysis, but a political analysis.Having read more of his work, its not really journalism, its advocacy and opinion journalism that he practices, which can hardly be called "fact". That is just silly. Is is interesting though, because Andy Kroll is one of the journalists (if not the journalist) responsible for pushing the "Walker/Koch connection'. He even brags that since he published his piece, the NY times and Washington Post picked it up and ran similar stories. As I point out in my original post and cited by Kroll, the Koch contributions were $43,000 out of a total of $7 million raised by Walker. Can you see why using, as a basis for your discussion, the political analysis of an individual who is actively pushing a meme that a contribution roughly 0.0061% of the whole is a relevant and dubious connection could call into question the capacity for belief of your story?